Another trend that re-appeared last year has definitely made a strong impression for spring and will most likely do the same for the summer season. The black and white striped pattern seems to be the most popular. Too popular in my opinion. A lot of people aim to be different, but still trendy. So this may be an obvious solution, try wearing your stripes in different colors. While everyone else is rocking their referee and Beetlejuice stripes, you’ll stand out with your multi-colored stripes. 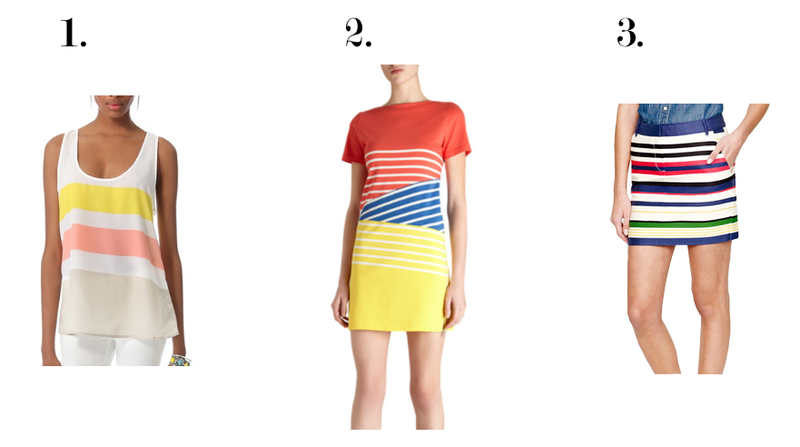 Since we are in the spring season, you shouldn’t find it too hard to find a top or bottom with colored stripes. I find that multi-color striped patterns exude spring and summer season. These types of stripes are also a great day-time pattern, more so than black and white stripes. Choosing multi-color stripes allows for a lot more versatility. With black and white stripes, you can either choose an accent color or pair them with more black or white. With color striped patterns, you can accessorize with multiple colors, and you can even choose a color outside the striped pattern to pair it with. When it comes to your wardrobe, it’s okay to have trendy items, but it’s definitely better to be different. So, step outside the box, put that black and white maxi skirt down, and opt for the teal and yellow stripped dress that would look fab with coral accessories. Happy striping! Posted on Tue.Apr.23.2013, in Fashion and tagged accent color, beauty, beauty & fashion, beauty and fashion, Black and White Stripes, Black and White Trends, blogger, clothing, color stripes, Colored Stripes, different colors, fashion, Fashion & Beauty, Fashion and Beauty, fashion and style, fashion blogger, fashion style, fashionista, Fblogger, Referee, Referee stripes, spring, Spring trends, Striped Trends, stripes, style, style & fashion, style and fashion, summer, Summer Trends, time pattern, Trend Alert, trends, trendy, Tyla times, white stripes. Bookmark the permalink. Leave a comment.